A friend contacted me the other day to share a beautiful photo she captured off of her baby daughter's nursery monitor. The monitor is in her living room and she heard odd sounds coming from the daughter's room (from the monitor speaker.) She looked at the monitor and saw some tiny figures which appeared to be situated on her daughter's dresser. She raced to the nursery and checked and SAW NOTHING. She keeps no nick knacks on the dresser. 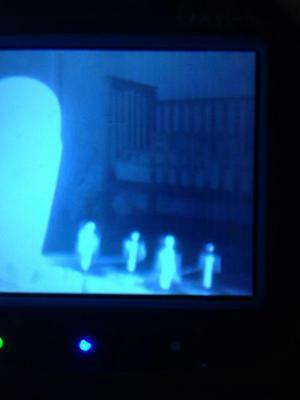 She returned to the monitor and the figures were still there so she photographed the monitor. It looks like a legion of small angels. Amazing!